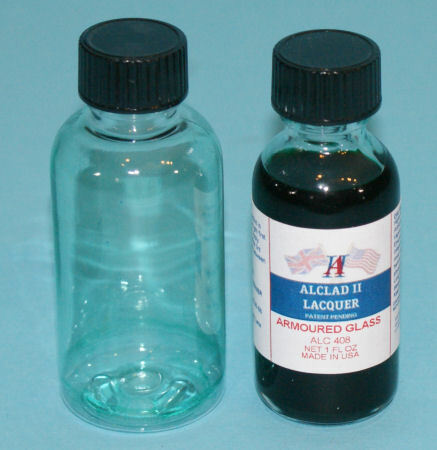 Alclad II has released a new product that is a clear coat with a blue tint that nicely replicates the look of armored glass and early coated optics. This stuff is just in time for the Bronco up-armored Humvee kits, the Humvee up-armor conversions, and the LMTV and FMTV trucks coming from Trumpeter. The clear parts in those kits are clear which just won't look right to armor modelers. This blue tint is also common to the armored glass found in the forward windscreens of the F-4, F-14, and even some older aircraft. When Alclad II sent out this sample, they were kind enough to send along an empty plastic bottle that had been treated with this tint and you can see for yourself that it captures that tone just perfectly. You should be able to purchase Alclad II Armoured Glass or any of their other fine products from any well-stocked retailer. My sincere thanks to Alclad II for this review sample.